The stories below were told to Alexander Schreiber by his aunt, Emma Urbach (née Schreiber) in November 2005 when Alexander visited Emma at her home in Germany. Aunt Emma told me about her life before and during the Second World War. Before the Revolution, my father (Conrad Georg Schreiber) worked as a groom (looking after the horses) for a rich merchant in the city of Engels. The merchant was Andrei (Heinrich) Heinz, my grandfather. Andrei Heinz was married for the third time and his wife did not pay much attention to the affections of a young groom for her stepdaughter, my mother, Nina Heinz. Konrad and Nina had been friends since they were young. When the Revolution began, the Communists confiscated all of grandfather Andrei’s property. My father and mother were married in 1918 and moved to Norka where they lived for some time. Father’s mum, Catharinа (née Schleicher), died in 1932, at the age of 85 years. At a nature park in the city of Albstadt, Germany – November 2005. 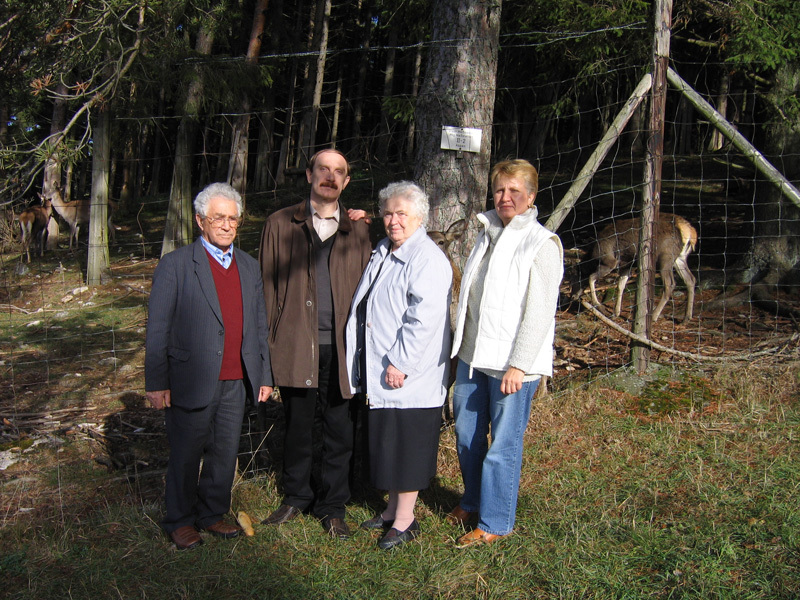 From left to right: Konrad Urbach, Alexander Schreiber, Emma Urbach (née Schreiber), Elvira Urbach (the wife Vladimir Urbach). Photograph courtesy of Alexander Schreiber. I remember our big whitewashed house. In the attic of the house we stored apples. In the same place lived small cats. We constantly got into the attic to see the cats and mum scolded us. After arrest of our father, my brother Sascha (Alexander Konrad Schreiber), became like a father to his younger sisters. He always brought us sweets. I remember once he brought a big package with halva. If it weren’t for Sascha, I would not have survived during war. In September 1941, a day or two before our deportation, it was clear that we would be taken away from Norka. On September 9th, we collected small apples from a garden to take with us. Sascha came from work and told us: "They (the Russian authorities) will collect anything that is not necessary to us". Soldiers soon arrived and took us away from Norka forever. Before our eviction, Sascha worked in a textile artel, and he brought home with him several meters of fabric. We took the fabric with us when we left Norka, and later in Zavjalovo, we exchanged the textiles for other products which helped us to survive. In the early spring of 1942, I was forced, along with other German girls, to join the Labor Army (Trud Armee). We were brought to the train station in Kulunda. After staying there for several days, they told us "Go home, only do not tell anyone that we have released you." In May 1942, I was again taken away to the Labor Army and was brought to the camp at Chelyabinsk. We lived in a two floor barrack and the beds were arranged in circles on each floor. Guards woke us in the morning and they collected people who had died during the night and put them on the street for disposal. These were very hard conditions. We worked from darkness in the morning until the darkness of night. We were frequently awoken at night to work with the command: "On bricks!" At night, we were sometimes able to take a bath. We could not bathe during the day since it was necessary to work. When I left the bath in wintertime, all of my hair froze and turned to ice. Some girls could not tolerate such a life and escaped from the camp. Anna Schleicher, a girlfriend and neighbor of Sascha’s from Norka (she lived in the house next to us) escaped from camp and we never heard any more about her. I remember that two girls escaped and hid in a sewer collector. They found them after several days covered with huge quantities of insects. I once stole a bread ration card. I wrote to Sascha and he sent me money. Without this money, I would have died. Sascha wrote letters to me. He informed that there was a citizen from Norka named Moor (Mohr) with him in the camp. Moor was one of those who organized the arrest of my father, Conrad, in 1937. Sascha told me that Moor killed Germans in the camp. He was probably a very bad person. In 1948, mum and I, along with the younger children, were going to move to be with Sascha in the Perm area. However, mum was not released from the camp in Zavjalovo. The family had debts from goods that were purchased at the camp and we were forced to pay all the debts before we could leave. Sascha sent mum part of money. Mum planned to use the money from selling their potato crop to pay the remainder of the debt. Sadly, my sister Ida died working in the potato field when she was hit by lightning. Lightning also touched mum and left her sick and injured. The stories below were told to Alexander Schreiber by his aunt, Emma Urbach (née Schreiber) in November 2005 when Alexander visited Emma at her home in Albstadt, Germany.